A small group of Digital Humanities enthusiasts met at the Prince Alfred Hotel in Carlton to discuss all things digital in the humanities. We did this in conjunction with UCL’s Centre for Digital Humanities in London who hold a similar monthly event. 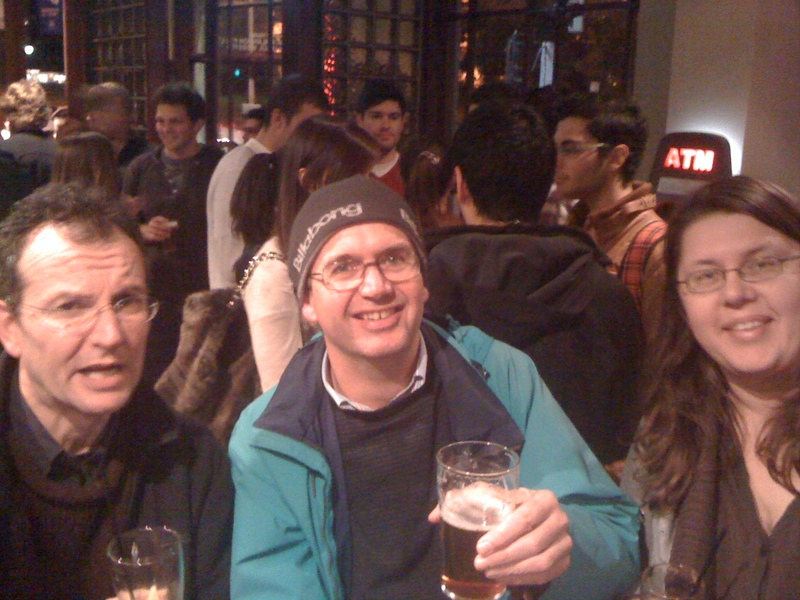 As it was the first week of Semester at the University of Melbourne, the Pub chosen was unfortunately on the route of a College pub crawl so our conversations were in competition with crowds of fresh undergrads complete with loud speaker! We did manage to discuss some of the activities of the Digital Humanities at Melbourne, including a proposed workshop in the Faculty of Arts showcasing some of the digital projects being developed. As a field, the ‘Digital Humanities’ is not as coherent in Australia as it is in come countries, but there is still interesting work happening in various research and service contexts within a number of disciplines. We discussed the possibility of setting up an ‘Australian Association for the Digital Humanities’ to bring together some of the existing digital projects and forums in the humanities with the possibility of holding a small conference sometime next year. Although those present did view the video of the Plenary of this year’s Digital Humanities conference by Dr Melissa Terrace, we didn’t really discuss it at length because of the loud-speaker and pub-crawling students. Next time we will bring our own loud speaker. I like the idea of an Australian Association for the Digital Humanities, Craig. If things move on that front, could I ask you consider expanding it to Australasia? I don’t speak for NZ digital humanists, but personally I don’t see much point in splitting the few resources we have Downunder between Oz and NZ. +1 on the idea of an Australasian DH association. ADHO needs broader representation, as long as the conference committees are drawn from the ADHO member associations those from “down under” won’t necessarily have their interests represented. Also, I’m hoping to bring DDH to North America (at least, to Indiana). Here’s to a worldwide consortium of DDHers! Perhaps you propose a discussion at THATCamp Canberra about the setting up of some sort of association? There’ll be people there from all over Australia. In any case I was thinking of finishing up with a ‘where to next’ discussion, looking towards THATCamp Melbourne and beyond!